Although Susan was just a kid at the time, she remembers the rudder rightly. We did finally end up in Grenada, after a breakdown stop in St. Thomas. This happened long ago and I’ve been lucky to now be back in touch with two of the other participants to help fill in details. As a delivery, Traumerei was great. She was a sturdy boat around 38 feet long, maybe 15 years old, that came with her owners, who knew her very well, their delightful daughter, Susan, and a handy teenager called Kevin who was the son of a friend. So why pay me to come along? Well Willard, although very capable, was having some problems with his eyesight as I remember and could not see too well. Luckily, his ears were still perfect and he loved music and kept a huge supply of classical tapes on board. Liz, quite a few years younger (it was a second marriage), was a very practical and able woman, but she was also homeschooling Susan, and was perhaps not confident enough to feel she could take charge if need be. If Traumerei had a downside, it was that she had a gas engine, though Willard was well attuned to it. Traumerei also had a small fuel tank so Willard had many jerry jugs of gas securely lashed to the rail with wooden boards sandwiching them on both sides. I did wonder about those gas jugs as we left Florida and all around us were lightning storms. Still it was day one and to suggest we ditch our entire fuel supply on the off chance we might be struck, and even then I had no idea what would happen if we were, seemed more than excessive. Happily, we never got right in a storm. We were later to be very grateful for the wooden boards. We followed the usual course for deliveries to the islands: we sailed to the Bahamas, cut through them to the Atlantic Ocean and beat our way southeast (no “Thornless Path” when you are trying to make time). And that is where we were, with St. Thomas in sight, when there was crack and we lost one of the lower shrouds. We put the boat about immediately to take the strain off the broken stay. Luckily, it had broken not far from the turnbuckle so it was not too hard to make a temporary repair. Willard had packed his boat with gear, and was ready for almost anything (just as well as it turned out). He managed to find a bulldog clamp of the right size, so we bent the wire in a big loop, clamped it, lashed it well to the turnbuckle, tightened it up, and continued to St. Thomas. Our next minor problem was that as we approached, the engine would not start, as the batteries were flat. When we last used the motor the ignition had somehow been left in the “on” position. Happily, in those days there was a big long dock with plenty of room in St. Thomas. Taking the helm while coming alongside a dock under sail on someone else’s boat, which is also their home, makes me nervous, but the approach was into the wind and we could control the speed by letting the sails flap. Willard had a good stock of fenders, which we deployed to the full, so if our arrival was not exactly elegant, at least we did no damage. We had now sailed well over a thousand miles but still had around 400 more to reach Grenada and did not want to chance it with rigging that had proved dodgy, so we decided to take a few days and re-rig. Back then, St Thomas had very little for yachts. There was a marina, one marine mechanic, and a chandlery of sorts. The rigging was 5/16ths inches in diameter, and we were unable to find it. We could buy quarter inch stainless rigging wire and the Norseman fitting to go with it, so we decided that brand new quarter would be much stronger than what we had, and we changed it all, using the very easy, do-it-yourself Norseman fittings. Willard was relieved and well pleased with the job. We set sail again on an optimistic note. We had new rigging wire, we were now in the Caribbean Sea, not the Atlantic, and the trades were blowing reliably. As always on a delivery, we planned the shortest route and set a direct course to Grenada, heading up a fair bit to allow for current. With Liz in charge, the food was good and there were plenty of healthy snacks, one of my favorites was to spread peanut butter in a stick of celery and munch away. No corned beef and crackers on this trip. The first night at sea was great, the trades were consistent and moderate. What could go wrong? The next day, Kevin was on watch when there was a flapping of sails, and a call that “the steering had gone”. As skipper I came into the cockpit and I had to try for myself just to make sure. He was right. I asked him to go look at the steering quadrant and see what was happening, with a bit of luck a wire would have broken and we could fix it. “the rudder stock has broken, the quadrant is flapping around and water is pouring in”. Not so good. Having no steering is not an immediate threat to life, a leak can be. Inspection showed that the stock, which had been built of hollow stainless tube, had sheered somewhere down in the rudder shaft and water was pouring out of the top. It was not too hard to cap it and stop the water. What next? We lowered sails to assess the situation. Kevin said he would be happy to snorkel over the side and see how the rudder looked. 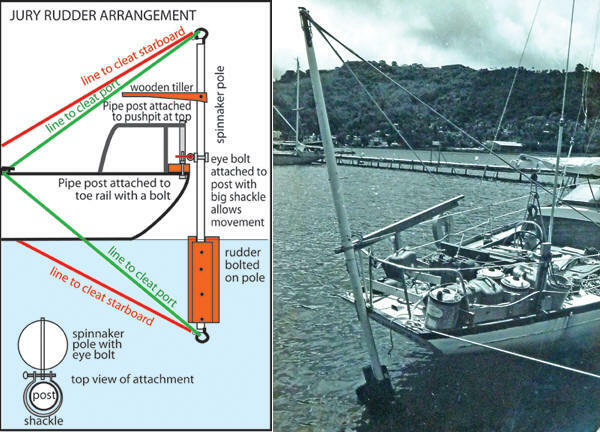 I thought that if the rudder was still securely in place and mobile, we might find a way of attaching a port and starboard line to the aft part of the rudder, bring them up to each side of the boat and thus steer. I seemed to have a memory that some of the old English barges had a hole drilled at the aft end of the rudder for just that purpose. Willard surely had just the right clamp to make the attachment. On surfacing, Kevin was not enthusiastic. The rudder was hanging in there but maybe not too securely, and there was so much movement from the seas, making an attachment would, in any case, be problematic. We were at this time 24 hours out of St. Thomas on a direct course for Grenada, and the nearest land was Saba about 60 miles due east, well out of sight. Could we get any help? Or at least alert someone that we had a problem? That proved problematic. Willard had equipped Traumerei with the very latest in marine radios: a VHF. But this was a fairly new system at this time and had not reached the islands. In those days, both yachts and ships in the Caribbean still used old battery-draining AM transmitters. Still, we gave it a go. No one was listening. This should surely be the time to beat my breast, gnash my teeth and fall on my knees and pray to some improbable deity, or at the very least have a minor panic tantrum, but it was hard to do. We were in the Caribbean Sea, the sky was blue we were well fed and the crew were all very calm, and they gave the impression that they were sure this was the kind of stuff a delivery skipper dealt with every day, so it could not possibly be a problem could it? It so happens that at some point on my journey to Florida I had picked up some American yachting magazine and read an article “what to do when your rudder breaks” What a relief – or maybe not. We decided to rehoist the sails and see if we could steer some kind of course by balancing them. Then as we moved along we could refine our steering according to the article. The boat was well balanced and we found she would sail along nicely if we sheeted the jib in and then we could steer higher or lower by easing or tightening the main. By letting the main out a long way and playing with the jib we could even get her to go on a beam reach. This was a pretty good range. Even better, if we got her clipping along on a close reach we could heft the main in tight, she would come up into the wind, the jib would back and we could tack her. It was a slow and cumbersome tack but it could be done. We managed to get her on a comfortable close reach towards Grenada. To do this the jib was in fairly tight and the main well out with the top third of the leech flapping. Now that we were moving, we decided to try to fine tune the steering a la yachting magazine article. The first thing we tried was the steering oar, which seemed to make sense. We constructed a reasonably decent oar, using the hollow wooden spinnaker pole and with a short plank bolted to it. We even shaped the plank a bit. With high hopes we lashed it securely to the center of the aft part of the boat, and then tried steering. In one sense it did steer the boat well; if you could move it, the boat turned. In another it was hopeless; in the Caribbean seas the forces on the thing were horrendous. It took three people tugging with all their might to even begin to control it; that would not do. Next we tried the bit where you drag something astern and steer by moving it from side to side. That also might work on a calm day in a flat sea, but was hopeless in the ocean. Still, balancing the sails was working beautifully; we were right on course for Grenada. The down side was at night when we saw shipping, and thought it was coming towards us. We had to tack while still a mile away to make sure we did not get close. Also, the continuously flapping sail took a toll on the stitching. At breakfast each day we would take the main down and Liz would hand stitch all the seams that were coming apart. We had fair confidence that we could sail right up into the lee of Grenada just as we were going. But what then, when we hit the fluky lee-shore winds? We needed a rudder and put our minds to how to construct it. But, you may ask, what use is a single pintail? The bottom part of the rudder would just sweep away to sea and mash up the whole arrangement. To overcome this, we decided to stay it. Two ropes from the top and two from the bottom of the pole leading to cleats on either side level with the cockpit would hardly create a rigid structure, but it should keep it aligned enough to use. We decided to give it a try. Willard had good tools, lots of hardware, and he was good at carpentry, so he, I, and Kevin worked on the new rudder. We had plenty of time, after all, no one had to steer now. The planks that lashed the cans to the boat were used to make the rudder blade. One thing that the steering oar fiasco had taught us was that the blade did not have to be very big. My memory may be faulty, but I think we made it about a foot wide and two to three feet high, starting with a board either side of the spinnaker pole and securely bolted through it. We wanted the steering to be easy so we balanced it with about 15 % of the area in front of the shaft, the rest behind. A few feet above the pivot point we fastened on a plank shaped to be the tiller, using some old metal strapping. Since the boat was sailing so well, there was no hurry to deploy it, we would wait till it was needed. Three days after we lost the rudder we arrived within a few miles of Grenada and as we came into the lee, the wind died; time to try our rig. Since we were not moving it was easy enough to install. In the swell our jury rudder rolled from side to side at the back of the boat in a pretty wide arc, but with the ropes tensioned fairly tight it was stable enough. We started the engine and put it in gear. To our delight the jury-rigged rudder worked perfectly, just like as a real one. A few hours later we came into GYS (now Port Louis) in Grenada and tied to a dock. The weird contraption on the stern attracted attention, people came by to hear our story. We all felt a sense of achievement for having dealt with this crisis and arriving safe in port unaided. Willard went off to organize the first steps for a real repair and got an appointment to haul the boat in Prickly Bay the next day. The rudder worked well enough that we figured we could sail the six miles there, though we did make arrangements for people to come look for us if we failed to show. The rudder worked so well that we were able to sail there without problem. As the boat was hauled you could see that cracks were beginning to appear on all the spinnaker poles’ glued seams. It had worked perfectly, but would not have lasted much longer. The real rudder was still hanging in place, so they just needed a new shaft.